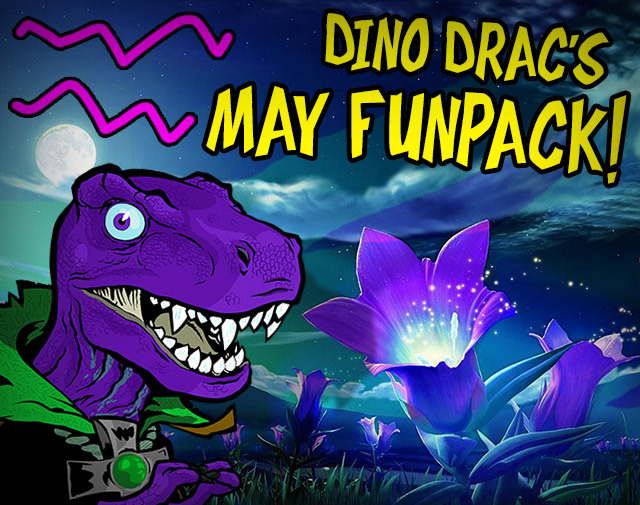 Dino Drac's May Funpack is available now! | Dinosaur Dracula! 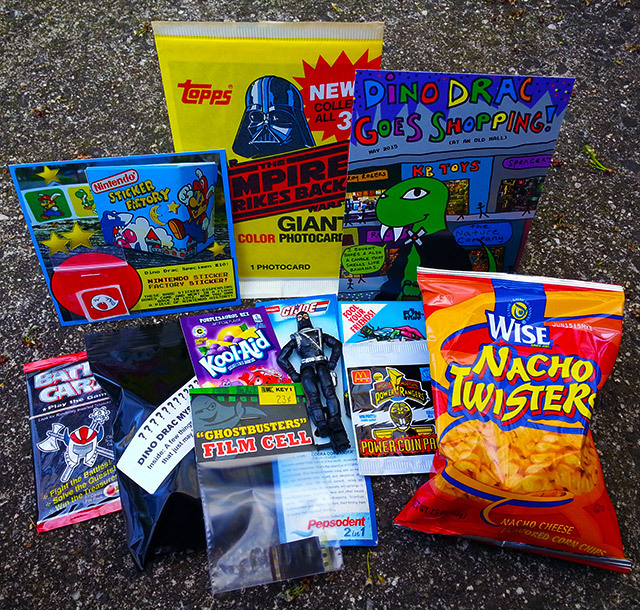 Dino Drac’s May 2015 Funpack is here! The quick-and-dirty version: Every month, I mail out a new Funpack. Subscriptions cost is $25 per month (that includes shipping), and you can cancel at any time. 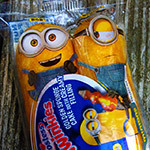 For as long as you remain subscribed, you’ll keep getting more Funpacks! Without these subscriptions, there’d be no Dino Drac, so many thanks again to all subscribers, old and new! Before I give you the deets on subscribing, let’s take a look at this month’s goods! – A Playskool G.I. 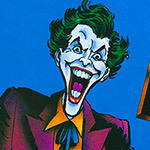 Joe figure from 2002 — part of an old Pepsodent promotion! Whaaat?! 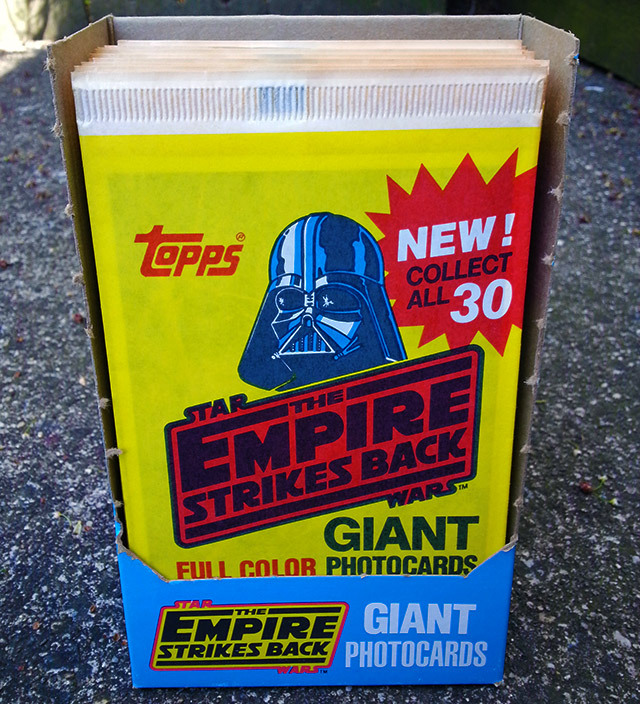 – A sealed pack of Empire Strikes Back Photocards from 1980! 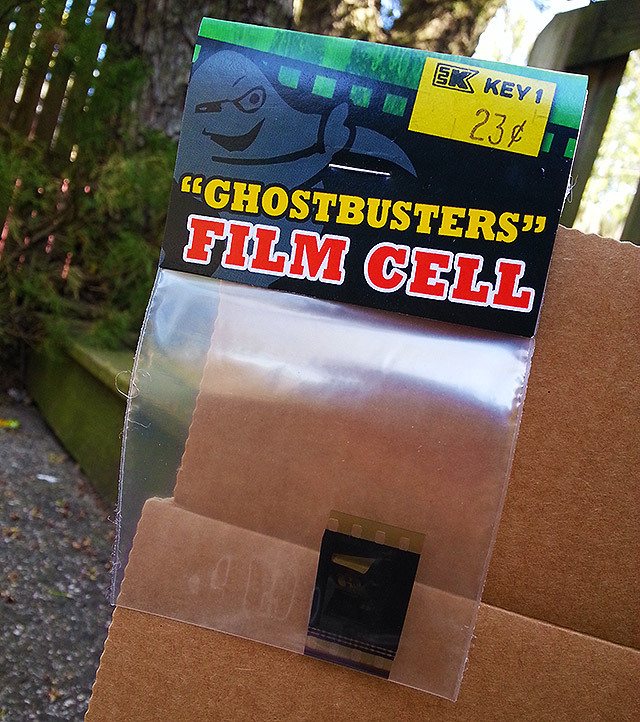 – A honest-to-goodness Ghostbusters film cell, in custom packaging! 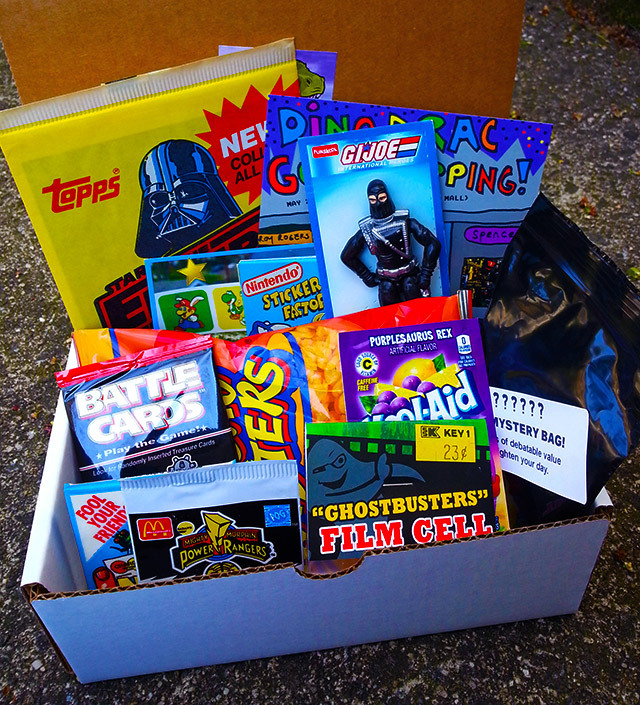 – Trading card packs, including Battle Cards and Topps Nasty Tricks! – A sealed McDonald’s Power Rangers “Power Coin Pack” from 1994! – Dino Drac’s May 2015 Ugly Mini Poster! – The May 2015 Specimen: A 1993 Nintendo Sticker Factory sticker! – A packet of still-fresh Purplesaurus Rex Kool-Aid! – A bag of Wise Nacho Twisters! – A Mystery Bag stuffed with a few more goodies! If you’re already sold, skip to the bottom of this post for subscription information. For the rest of you, let’s take a closer look at this month’s loot! I’m very pleased about this one! Every subscriber will receive one real actual G.I. Joe figure, from 2002! 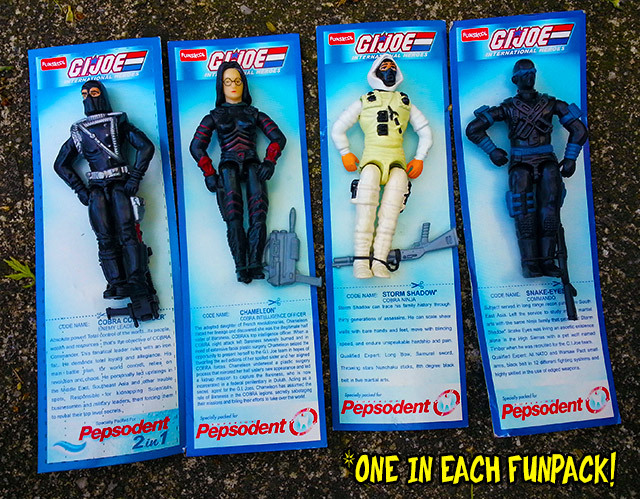 Now, what makes these interesting is that they were originally given away as part of a Pepsodent promotion. Yes, Pepsodent. Each figure includes its Pepsodent promo card, and each comes with a weapon! There are four available, and they’re all great characters! Each subscriber will receive one at random. 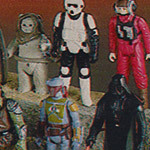 Available figures include Cobra Commander, Storm Shadow, Snake Eyes and Chameleon. (FYI: Chameleon is basically Baroness.) 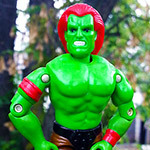 These Joe figures were under the Playskool banner, so they have a quaint “bootleg” appeal. They’re charmingly rough around the edges with few points of articulation, but make no mistake, they’re Joes! IMPORTANT NOTE: These figures are attached to their cards by very thin rubber bands which are by this point VERY brittle. I’m cherry-picking the best of them but please understand that the bands break easily. Makes no difference if you planned to take the figure off the card anyway, though! Some cards have a little denting, but nothing too bad. Another big one! Each subscriber gets one sealed pack of Empire Strikes Back Photocards, from 1980! Every pack includes just one card, but they’re each 5×7” — the same size as the Mini Posters I send out. These glossy cards feature various characters from The Empire Strikes Back — everyone from Yoda to the bounty hunters! Whether you open yours or not is up to you. After all, the wrappers are pretty damn cool! This month’s Ugly Mini Poster features Dino Drac shopping in what appears to be a curiously old mall. See if you can spot all of the long-closed store chains! 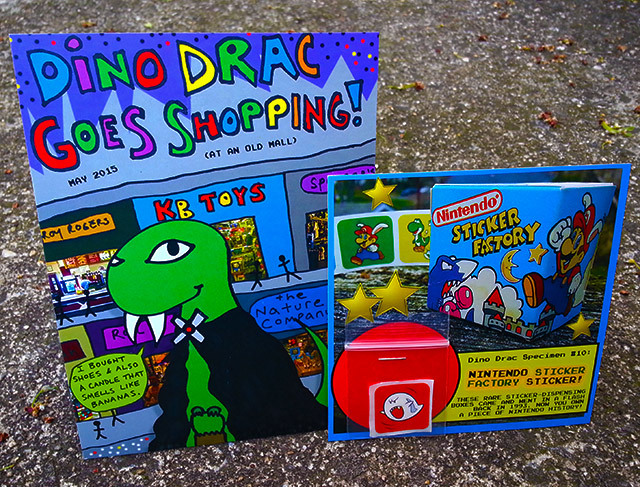 This month’s Dino Drac Specimen gets you one sticker from a 1993 Nintendo Sticker Factory box. These sticker boxes are pretty rare, but at least now you’ll get to own a part of them! There are many different stickers available. You’ll get one at random, cut, bagged and stapled to a custom Dino Drac display card! Trading cards are always a part of my Funpacks, but this month, I wanted to give you packs from some really obscure sets. 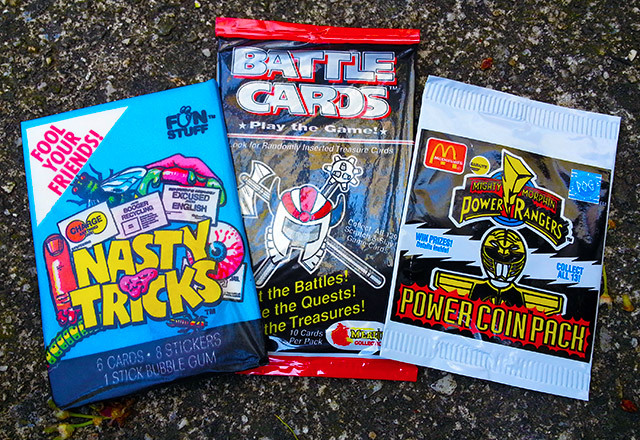 Every subscriber will receive one pack of Battle Cards (basically fantasy-themed scratch-off games), along with a very vintage pack of Topps Nasty Tricks! You’ll also get a sealed McDonald’s Power Rangers Power Coin Pack, from 1994! Each includes one Power Rangers pog. There are thirteen in the series… which one will you get? If sorting through all of these ridiculous things makes you hungry, I’ve got you covered! 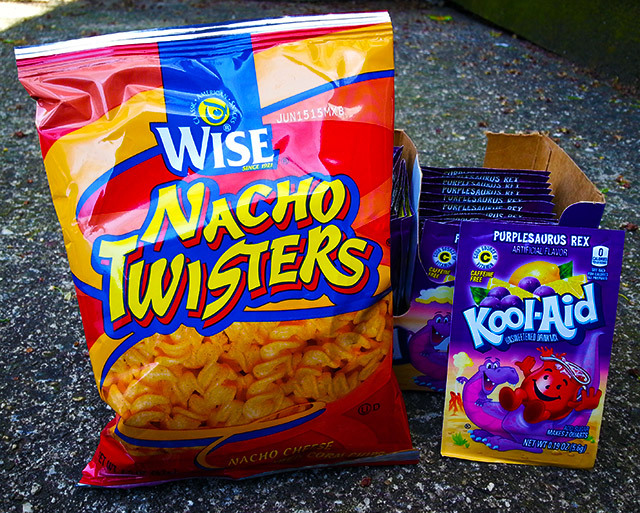 Every Funpack comes with a small bag of Wise Nacho Twisters, AND a fresh pack of Purplesaurus Rex Kool-Aid! Wow! Snack like you’re in the second grade, all over again! Each subscriber will also receive a Ghostbusters film cell, in custom packaging! These feature various scenes from the movie. They’re genuine, but please note that the “cuts” aren’t always perfectly straight, nor can I really account for their origin — so let’s call them “novelties” with a wink. Very cool bonus item for Ghostbusters fans! 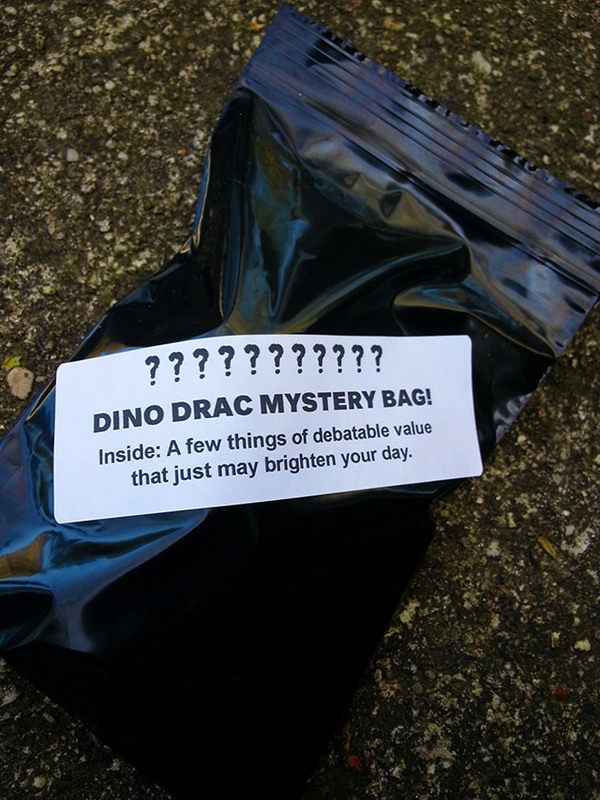 Last but not least, every Funpack comes with a Dino Drac Mystery Bag! Each will have a couple of things inside — trading card packs, small toys, stickers and so on. Included are both “overstocks” from prior Funpacks, and things that I didn’t have in strong enough quantities to promise to everyone. It’s unlikely that any two will be exactly alike. So long as you don’t expect too much, I think you’ll enjoy ‘em. It’s like a Funpack within a Funpack! All that, plus the newsletter, for $25 shipped! Help keep the site afloat and get a box of junk for your troubles! Ready to subscribe? Click the button at the bottom of this post. But first, just a few notes! 4. You will be automatically billed every month. If you subscribe today, you’ll pay today, and then again in exactly one month. For as long as you remain subscribed, you’ll keep getting Funpacks! 5. You can cancel at anytime. (You could subscribe today and cancel today!) If you cancel after you’ve already been charged for the following month’s Funpack, you’ll of course receive it just the same as any current subscriber would. You always get what you pay for! 6. The May 2015 Funpacks will ship on or before 5/13! Thanks again to all subscribers, old and new! If you’re already a subscriber and you’d like to stay that way — do nothing! You’re all set! If you’re new to this and you’d like to sign up, simply click on the button below to get started! SORRY, THE DEADLINE HAS PASSED FOR MAY! STAY TUNED FOR JUNE’S FUNPACK, COMING SOON! 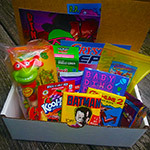 Dino Drac’s January 2017 Funpack!